Nitrous oxide is administered by inhalation, absorbed by diffusion through the lungs, and eliminated via respiration. The elimination half life of nitrous oxide is approximately 5 minutes. It is excreted essentially unchanged (ie, nonmetabolized) via the lungs; less than 0.004% is actually metabolized in humans. As a general anesthetic, it is very weak and is generally not used as a single agent. It may be used as a carrier gas with oxygen in combination with more potent general inhalational gases for surgical anesthesia. In dentistry, it is commonly used as a single agent (with oxygen) for partial sedation, most commonly in pediatric dental populations. One of the most common uses of nitrous oxide in anesthesia is during mask induction of general anesthesia in pediatric patients. It is combined with oxygen and incrementally increasing doses of a more potent inhalational anesthetic (eg, sevoflurane) and delivered via mask inhalation. In dentistry, nitrous oxide is indicated to decrease the pain and anxiety associated with procedures. It is commonly delivered by a nasal mask in combination with oxygen. The specially designed nasal mask fully covers the nose, allowing the mixture of nitrous oxide with oxygen to flow while the dentist works on the patient’s mouth. Overall, nitrous oxide is a very safe drug with few absolute contraindications. The blood:gas partition coefficient of nitrous oxide is 34 times greater than that of nitrogen. This differential solubility means that nitrous oxide can leave the bloodstream and enter air-filled cavities 34 times faster than nitrogen. As a result, nitrous is contraindicated in patients in whom expansion of these air-filled cavities could compromise patient safety. This includes patients with pneumothorax, pulmonary blebs, air embolism, bowel obstruction, and those undergoing surgery of the middle ear. Caution must be exercised in individuals with a history of stroke, hypotension, and known cardiac conditions. Nitrous oxide is relatively contraindicated in pregnancy. It is known to have potential teratogenic and fetal toxic effects, particularly with chronic use. Dental nitrous oxide may be contraindicated in patients with severe nasal congestion, those who breathe through their mouths, or those unable to wear a nasal mask. Some patients, especially children experiencing severe anxiety or extreme uncooperativeness, may not be good candidates for this milder therapy and may require more potent sedating intravenous or general anesthesia. Debate regarding the safety and efficacy of this commonly used inhalant anesthetic is ongoing among anesthesiologists. Some anesthesiologists advocate abandonment of the drug and others use it routinely. Nitrous oxide use in westernized countries seems to have decreased and is being replaced with other more potent, safe, and short-acting inhalation anesthetics (eg, sevoflurane, desflurane). However, nitrous oxide is still widely used in developing countries because it is inexpensive, readily available, easily administered, and has a long-standing safety record. Nitrous oxide is reported to be safe in patients with a history of malignant hyperthermia. Since it is metabolized by the lungs, it does not have any associated nephrotoxicity or hepatotoxicity. Nitrous oxide has been used for obstetric analgesia (primarily outside of the United States). Nitrous oxide is often times mixed in a 1:1 ratio with oxygen; the mixture is otherwise known as Entonox. Labor pains have been shown to significantly decrease with the use of Entonox. The mechanism of action of nitrous oxide is trifold and includes analgesia, anxiolysis, and anesthesia. Its analgesic mechanism of action is described as opioid in nature and may involve a number of spinal neuromodulators. The anxiolytic effect is similar to that of benzodiazepine and may involve gamma aminobutyric (GABA) receptors. The anesthesia mechanism may involve GABA and possibly N-methyl-D-aspartate receptors as well. In general, the effect of nitrous oxide ceases as soon as the inhalation stops, with no residual effect. 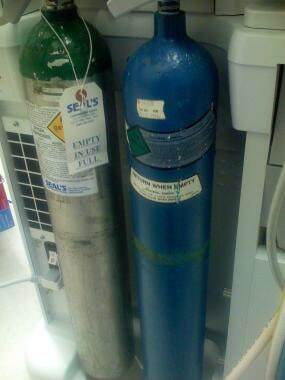 Nitrous oxide is stored in closed gas cylinders. Oxygen and nitrous oxide, shown in the images below, are part of the required equipment. Oxygen and nitrous oxide tanks used in anesthesia delivery equipment. Smaller unit in a dental office. 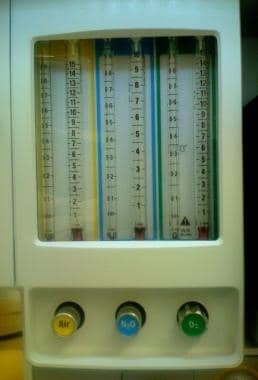 Attached flow meters like the one shown below restrict the proportion as well as the flow rate of nitrous oxide in order to keep a minimum oxygen concentration. This minimum concentration is usually 21% (room air). Flow meters used in anesthesia delivery equipment to adjust the flow of nitrous oxide, oxygen, and air. Anesthesia machines have safety mechanisms to restrict the lower limit of oxygen delivery to 21%. Dental administration uses a partial mask that covers the nose but allows access to the mouth. Surgical anesthesia uses a full face mask that covers the nose and mouth. Alternatively, nitrous oxide may be administered via an endotracheal (ET) tube. For each method of administration, proper equipment, monitoring, and storage unit integrity are necessary in order to avoid unintended gas leakage or excessive exposure. An example is shown in the image below. 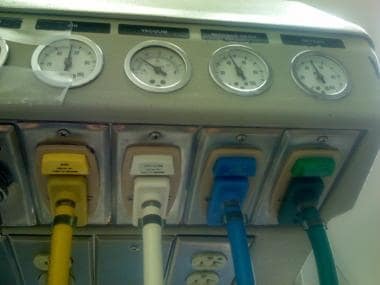 Ceiling-mounted gas pipes used for delivery of anesthetic gases: oxygen (green), nitrous oxide (blue), air (yellow), vacuum (white). For general anesthesia, most patients are placed in the supine position. For dental anesthesia, patients are reclined in a seated position. Position the patient as described above. Secure the mask and start the flow of nitrous oxide, as in the image below. Ideally, proper ventilation should include a fresh air ventilation system, a nitrous oxide scavenging system, or both. 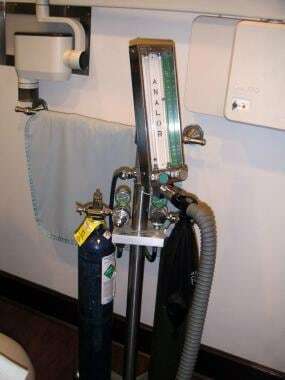 Because nitrous oxide is not heavily metabolized during inhalation, it may build up in the treatment area, particularly if the room is poorly ventilated. Staff may be affected by the exhaled nitrous oxide and experience some of the same effects as the patient undergoing treatment. Proper security and safety precautions for the nitrous oxide cylinders may be advised to decrease potential risk of after-hours access and abuse by medical and dental staff. Adverse effects that may be associated with nitrous oxide include gagging, coughing, hypotension, asthma attack, involuntary tracheal closure (spasm), lung damage, neuropathy, tinnitus, extremity numbness, anoxia and general respiratory distress, cardiac events (including myocardial infarcts), seizures, misperception of time, and vision-altering perceptions. Additional adverse effects include possible exacerbation of vitamin B12 deficiency, anemia, and decreased hematopoiesis. Further studies may be needed to elucidate these observations. Nitrous oxide has been shown to potentially inhibit methionine synthetase and cause an increase in homocysteine (Hcy) levels. Elevated Hcy levels have been correlated with increased postoperative complications, including possible cardiovascular morbidity. The clinical implications of these limited studies may require further confirmation and evaluation. Nitrous oxide may have neurotoxic effects of unknown significance on both infantile and senescent central nervous systems. The clinical relevance or significance of these effects requires investigation. Vitamin B12 deficiency should be considered in the differential diagnosis of patients who present with psychiatric or neurological manifestations, especially in those with a clear history of nitrous oxide exposure. Pertinent laboratory testing should include B12, homocysteine, and methylmalonyl coenzyme A (CoA) levels. Although levels of B12 may be low to normal, levels of methylmalonyl CoA and homocysteine may be elevated. Because of the potential delay in the appearance of clinical symptoms, the history of nitrous oxide exposure may be days to weeks prior to the presentation date. Intramuscular administration of cobalamin may be curative in these cases. Recovery may be slow even with high doses of vitamin B12. Potentially dangerous adverse effects include overdose, hypoxia, severe hypotension, unconsciousness, or death. High nitrous oxide concentrations have been associated with severe hypoxia and death from asphyxiation. Emmanouil DE, Quock RM. Advances in understanding the actions of nitrous oxide. Anesth Prog. 2007 Spring. 54(1):9-18. [Medline]. Sethi NK, Mullin P, Torgovnick J, Capasso G. Nitrous oxide "whippit" abuse presenting with cobalamin responsive psychosis. J Med Toxicol. 2006 Jun. 2(2):71-4. [Medline]. Browne DR, Rochford J, O'Connell U, Jones JG. The incidence of postoperative atelectasis in the dependent lung following thoracotomy: the value of added nitrogen. Br J Anaesth. 1970 Apr. 42(4):340-6. [Medline]. Coke JM, Edwards MD. Minimal and moderate oral sedation in the adult special needs patient. Dent Clin North Am. 2009 Apr. 53(2):221-30, viii. [Medline]. American Academy of Pediatric Dentistry Council on Clinical Affairs. Guideline on appropriate use of nitrous oxide for pediatric dental patients. Pediatr Dent. 2005-2006. 27(7 Suppl):107-9. [Medline]. Parlow JL, Milne B, Tod DA, Stewart GI, Griffiths JM, Dudgeon DJ. Self-administered nitrous oxide for the management of incident pain in terminally ill patients: a blinded case series. Palliat Med. 2005 Jan. 19(1):3-8. [Medline]. Rosen MA. Nitrous oxide for relief of labor pain: a systematic review. Am J Obstet Gynecol. 2002 May. 186(5 Suppl Nature):S110-26. [Medline]. Furuya A, Ito M, Fukao T, et al. The effective time and concentration of nitrous oxide to reduce venipuncture pain in children. J Clin Anesth. 2009 May. 21(3):190-3. [Medline]. Divatia JV, Vaidya JS, Badwe RA, Hawaldar RW. Omission of nitrous oxide during anesthesia reduces the incidence of postoperative nausea and vomiting. A meta-analysis. Anesthesiology. 1996 Nov. 85(5):1055-62. [Medline]. Sun R, Jia WQ, Zhang P, Yang K, Tian JH, Ma B, et al. Nitrous oxide-based techniques versus nitrous oxide-free techniques for general anaesthesia. Cochrane Database Syst Rev. 2015 Nov 6. CD008984. [Medline]. Tanchyk A, Tanchyk A. The absolute contraindication for using nitrous oxide with intraocular gases and other dental considerations associated with vitreoretinal surgery. Gen Dent. 2013 Sep-Oct. 61 (6):e6-7. [Medline]. Vote BJ, Hart RH, Worsley DR, Borthwick JH, Laurent S, McGeorge AJ. Visual loss after use of nitrous oxide gas with general anesthetic in patients with intraocular gas still persistent up to 30 days after vitrectomy. Anesthesiology. 2002 Nov. 97 (5):1305-8. [Medline]. Hart RH, Vote BJ, Borthwick JH, McGeorge AJ, Worsley DR. Loss of vision caused by expansion of intraocular perfluoropropane (C(3)F(8)) gas during nitrous oxide anesthesia. Am J Ophthalmol. 2002 Nov. 134 (5):761-3. [Medline]. Lee EJ. Use of nitrous oxide causing severe visual loss 37 days after retinal surgery. Br J Anaesth. 2004 Sep. 93 (3):464-6. [Medline]. Nitrous oxide may be a hazard after retinal surgery. BMJ. 2002. 325(7363):[Full Text]. Olfert SM. Reproductive outcomes among dental personnel: a review of selected exposures. J Can Dent Assoc. 2006 Nov. 72(9):821-5. [Medline]. Cleary AG, Ramanan AV, Baildam E, Birch A, Sills JA, Davidson JE. Nitrous oxide analgesia during intra-articular injection for juvenile idiopathic arthritis. Arch Dis Child. 2002 Jun. 86(6):416-8. [Medline]. Wu R, Okrainec A, Penner T. Laparoscopic Peritoneal Dialysis Catheter Insertion Using Nitrous Oxide under Procedural Sedation. World J Surg. 2014 Sep 5. [Medline]. Myles PS, Leslie K, Chan MT, Forbes A, Peyton PJ, Paech MJ, et al. The safety of addition of nitrous oxide to general anaesthesia in at-risk patients having major non-cardiac surgery (ENIGMA-II): a randomised, single-blind trial. Lancet. 2014 Aug 14. [Medline]. Baum VC. When nitrous oxide is no laughing matter: nitrous oxide and pediatric anesthesia. Paediatr Anaesth. 2007 Sep. 17(9):824-30. [Medline]. Zier JL, Liu M. Safety of high-concentration nitrous oxide by nasal mask for pediatric procedural sedation: experience with 7802 cases. Pediatr Emerg Care. 2011 Dec. 27(12):1107-12. [Medline]. Kavanagh T, Buggy DJ. Can anaesthetic technique effect postoperative outcome?. Curr Opin Anaesthesiol. 2012 Jan 19. [Medline]. Zier JL, Doescher JS. Seizures temporally associated with nitrous oxide administration for pediatric procedural sedation. J Child Neurol. 2010 Dec. 25(12):1517-20. [Medline]. Tsze DS, Mallory MD, Cravero JP. Practice Patterns and Adverse Events of Nitrous Oxide Sedation and Analgesia: A Report from the Pediatric Sedation Research Consortium. J Pediatr. 2016 Feb. 169:260-5.e2. [Medline]. Mandal PK, Schifilliti D, Mafrica F, Fodale V. Inhaled anesthesia and cognitive performance. Drugs Today (Barc). 2009 Jan. 45(1):47-54. [Medline]. Collado V, Nicolas E, Faulks D, Hennequin M. A review of the safety of 50% nitrous oxide/oxygen in conscious sedation. Expert Opin Drug Saf. 2007 Sep. 6(5):559-71. [Medline]. Rowland AS, Baird DD, Shore DL, Weinberg CR, Savitz DA, Wilcox AJ. Nitrous oxide and spontaneous abortion in female dental assistants. Am J Epidemiol. 1995 Mar 15. 141(6):531-8. [Medline]. Burnweit C, Diana-Zerpa JA, Nahmad MH, et al. Nitrous oxide analgesia for minor pediatric surgical procedures: an effective alternative to conscious sedation?. J Pediatr Surg. 2004 Mar. 39(3):495-9; discussion 495-9. [Medline]. Myles PS, Chan MT, Leslie K, Peyton P, Paech M, Forbes A. Effect of nitrous oxide on plasma homocysteine and folate in patients undergoing major surgery. Br J Anaesth. 2008 Jun. 100(6):780-6. [Medline]. Myles PS, Leslie K, Chan MT, et al. Avoidance of nitrous oxide for patients undergoing major surgery: a randomized controlled trial. Anesthesiology. 2007 Aug. 107(2):221-31. [Medline]. Freed WJ, Cannon-Spoor HE, Rodgers CR. Attenuation of the behavioral response to quisqualic acid and glutamic acid diethyl ester by chronic haloperidol administration. Life Sci. 1989. 44 (18):1303-8. [Medline]. The authors would like to extend their appreciation to Dr. Muna Soltan, Dr. Shahriar Alikhani, Dr. Ally Alai, and The Skin Center at Laguna for their contribution of clinical photos for this topic.